Deputy Governor Dan Hynes today released the first details of the Pritzker Administration’s plan for addressing Illinois’ pension crisis. First, the state will borrow to pay off pension debt by offering a $2 billion pension obligation bond. We and many others have already written very extensively on why pension obligation bonds are irresponsible. One credit card to another solves nothing and adds risk. Second, the state will kick the can on its ramp for taxpayer pension contributions out seven years. The new goal for reaching 90% funding (which is still inadequate) will be 2052. Your grandchildren will fully understand why pensions are called “intergenerational theft. Third, the state will gift public assets to the pensions. The particular assets and their value remain to be identified, but speculation has centered on the Illinois Tollway, the Illinois Lottery and government office buildings. The concept goes by the name “asset transfer.” We explained why it’s a sham in an article just yesterday. A pension actuary writing in Forbes did the same. The combined effect of the first two is odd. All $2 billion from the bond offering will go immediately to the pensions, but the regularly scheduled pension contribution for the upcoming fiscal year will drop by $800 million. That $800 million will be needed by the administration to balance the upcoming budget, to which it has firmly committed. Pritzker’ budget speech will be on February 20 and will have the details. We have no idea how Pritzker will be able to claim a balanced budget, even with that $800 million and even using all the gimmicks available under the phony budget accounting rules used by the state. Those phony accounting rules show the upcoming budget to be $3.2 billion short, according to the Pritzker administration. But see my colleagues’ article showing why, if the state were truly paying its bills, the shortfall would be $9 billion. In other words, the true shortfall amounts to almost one-fourth of the budget, almost three times the government number Pritzker is using, which most of the press falls for. 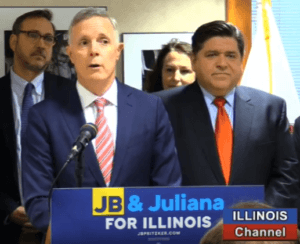 We can’t say this often enough: The budget numbers the regular press focus on are junk, and shortfalls of the magnitude Illinois faces cannot be fixed without drastic, structural remedies. The pension specifics were part of a speech delivered by Hynes at the City Club, the full text of which is linked here. Also in the speech, Hynes repeatedly trumpeted a progressive income tax as the gold at the end of the rainbow. “The fair income tax will change the arc of this state’s finances in a very positive way – forever,” he said. He already has some of it spent. The state, he says, will dedicate $200 million per year out of the additional revenue from a progressive income tax to pensions, in addition already scheduled taxpayer contributions. Good grief. $200 million per year is almost meaningless. Currently, pension and related healthcare contributions are running about $6 billion short of what actuaries say they should be, as my colleagues’ piece today explains. And the progressive tax requires a constitutional amendment that the public will have to vote on, which can be no earlier than 2020. We think its chances are slim. Pritzker and his party seem drunk on their overwhelming election success last year, believing their own you-know-what about the progressive utopia they painted for voters. In reality, the “fair tax” panacea for our fiscal crisis is myth, which is why Pritzker has never offered specifics. We’ve documented why repeatedly. It either won’t raise much money or the rates would be absurdly high, even for the middle class. Pritzker’s own budget advisor during his transition offered a specific set of rates that he admitted would raise just $2 billion per year, not even enough to cover the current budget deficit. Reality is on the march. So is math. In its first skirmish with them, the Pritzker Administration fled the battlefield.